This episode of the Jazz Road Trip actually begins here in Erie on a Sunday evening. Rene Marie’s performance at the D’Angelo P.A.C. got the engine running and warmed up in fine fashion. Her sassy, self confident persona…well, you were probably there, so there’s no point in redundant recapitulation. The following night, Monday, The Blue Note Club in Manhattan was the scene. 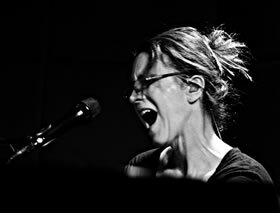 A month-long birthday celebration for Chick Corea found many artists sandwiched into the schedule for one evening only appearances and on this night it was Patricia Barber. Having heard her in Chicago just five months prior, I was most anxious to hear her band ply its magic on a Big Apple audience. But it was not to be. She did have a quartet, but the young faces on the bandstand constituted a pickup band that unfortunately did not posses the telepathic chemistry of her working band. Her voice never sounded better and several instrumentals focused attention on her competent piano technique, which is too often overshadowed when she sings with her working band. The performance relied heavily on duets with the young Turks and lengthy solos from each; the best of these being “I Thought About You.” The set ended with “Someday My Prince Will Come” and “Snow” which, while a staple of her songbook and certainly enjoyed tonight, just accentuated the absence of her working band. Expectation all too often breeds disappointment, so like any good jazzer, I decided to improvise, so as to put a positive ending on the evening. Rather than head back to the hotel, my destination became the 55 Bar to hear Helen Sung’s quartet play the late set. This prohibition-era speakeasy is the tiniest club you can imagine and after the crowded confines of the Blue Note, it was a relief to be one of only two-dozen patrons at the 55. Sung was playing Fender Rhodes tonight with Tom Guarna on guitar, Dezron Douglas on bass and drummer E.J. Strickland rounding out the combo. The music was energetic and swinging and it was impossible not to sway upon my barstool and snap my fingers to the driving rhythms that Strickland set down. Guarna soloed fluidly on his hollow-body axe and seemed to accept the hand-off from Helen’s solos with the same ideas in mind. I’ve never heard Sung on an electric keyboard before (once when on tour with T.S. Monk, she played a solo, stride style piece on a Steinway Grand that was a jaw-dropping collision of Fats Waller and Oscar Peterson that left no doubt of her staggering chops) and thought that I heard were some Chick Corea-isms in her playing. This was somewhat confirmed when for their third number, they played “Armando’s Rhumba” in honor of Chick’s 70th birthday. Douglas’ choice of fat notes and solid sense of time was consummate throughout the set, whether utilizing acoustic or electric bass. Leaving the 55, a smile was restored to my face. The following night, Tuesday, the destination was Jazz Standard. For the ninth consecutive year, Maria Schneider’s orchestra held court for Thanksgiving week. Employing an eighteen-piece ensemble, this performance space had some musicians spilling off of the bandstand onto floor level (my right elbow was practically in the bell of Scott Robinson’s baritone sax and Donny McCaslin’s tenor was aimed straight at my temple). The set began with “Allegresse” and featured a fiercely focused Ingrid Jensen on trumpet. Her expansive technique sounded supremely confident without ever crossing the line towards hubristic excess. It is perhaps too clichéd to say that Schneider’s gorgeous melodies are pastel in nature, but nobody else writes and voices horns this beautifully. Yet when this band shifts into overdrive and George Flynn’s bass trombone punctuates the section’s passages, it can make your fillings vibrate. “Gumba Blue” had a pyrotechnic soprano sax solo by Steve Wilson that sounded urgent, as though he’d waited all year to play it. As was the case with all featured soloists, Schneider sat down during the solo, listened intently, and established eye contact that seemed to peer into the depths of their soul. The rhythm quartet within the ensemble backed the soloist, who seemed at liberty to develop their musical thoughts to no set length of bars or choruses. When Schneider sensed that the solo was reaching a climatic apex, she brought the accompaniment of the ensemble back in for maximum sonic apogee. “Thompson Fields” featured a fluid guitar solo from Lage Lund that was the epitome of mellifluously executed restraint. The best possible dream-come-true was the set’s inclusion of “Cerulean Skies.” After a heartfelt explanation of the imagery that the music was to “paint,” she let loose the various birdcalls, played by musicians and selected members of the audience alike. The sound was so ethereal and palpable that I honestly don’t think anyone was breathing for the first two minutes (at least I wasn’t). Judging from her body language, Schneider took immense delight in conducting the band to bring her composition to life. This piece is so beautifully powerful that goose bumps repeatedly appeared on my forearms and my eyes moistened more than once. 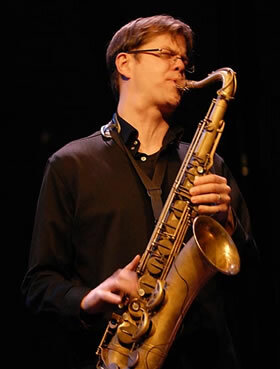 The swells of the music, like moonlit waves on a secluded beach, eventually led to a promethean, stream-of-consciousness solo from Donny McCaslin, on tenor saxophone. As he gained momentum, his frenzy of well-chosen notes became an avalanche pouring out of his tarnished horn, while sweat covered his face. At the solo’s conclusion, he sat down and emitted an audible, “Whew!” Tension and release is crucial to any music and Schneider is a grand master. She brought the band down and let the music’s textures soothe and calm the room before the next soloist. This respite also included more birdcalls and the accordionist fluttering his keys so that they sounded like flapping wings. A jabbing alto solo from Dave Pietro provided the perfect bookend to McCaslin’s solo, completing the well-designed symmetry of the composition. When the piece concluded, over twenty minutes from its beginning, every set of hands in the place erupted in applause that was as sincere as the music was genuine. Live jazz; there’s nothing like it!